About this item: Diana and Maura present a beautifully crafted accessory from Guatemala. 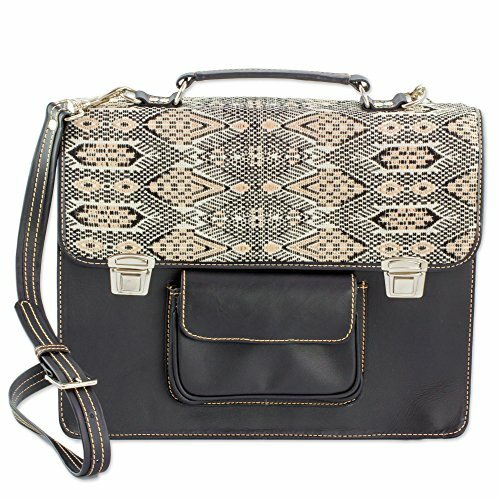 With a body of coal black leather, this laptop bag features a flap with kaleidoscopic motifs in ivory, ecru, and black, handwoven from cotton on the backstrap loom. A leather handle, adjustable strap, and recycled brass fixtures adorn the messenger bag, which opens with tuck lock clasps to reveal a beige cotton lining with three open compartments and a single zipper pocket. The central compartment is padded to protect a laptop or tablet of up to 14 inches. A leather pocket located on the front can be used to store small items. The laptop bag arrives with a 100% cotton storage bag to keep it clean. NOVICA works with Diana and Maura to craft this item. Exceptional Quality: crafted with care to be treasured as a keepsake for many years to come.